It’s murder, I say! Murder! Well, I don’t say it … Gray’s Papaya does. The Manhattan hot dog institution is about to raise its prices once again. This will be the third price increase since I moved to the Upper West Side in 2004. Okay, it’s hard to hate the folks who sell two hot dogs and a drink for a modest $4.50, though I was much happier when it was a dollar cheaper, back in 2008. Seven years ago, one hot dog cost only 85 cents. Then it skyrocketed, on a relative basis, to $1.25 in 2005, inching up to $1.50 three years ago. %Gallery-126040%The deal, which still returns change for a $5 bill, is called the “Recession Special,” which took real meaning in 2008, as New York City suffered the shock of the financial crisis. 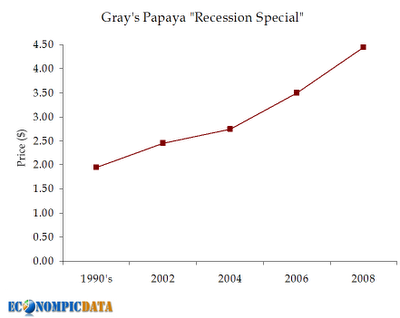 Since then, as we have struggled toward a recovery that never really seems to come, the Gray’s Papaya Recession Special has been a fantastic alternative to … well, just about everything. But, where will the prices go next? It’s hard to say. The notice has been up for a few weeks, but I have yet to see any indication of price change. The guy working behind the counter said he didn’t know where prices were headed and that they would probably take effect in early June. I walked by a few days ago and didn’t see anything different. There is a lesson in all this: buy hot dogs. If you bought hot dogs from Grays’ Papaya in 2004 at 85 cents each, they would have nearly doubled in value by 2008. With all the gripes were hearing about food inflation, it’s pretty safe to say that we’ll see another big spike in 2011. Hot dogs are the new gold. I guess the only problem would be storing them. I do suspect, though, that hot dogs are like Twinkies – they last forever. If you find yourself in New York, definitely hit Gray’s Papaya. If the prices are higher than you expect, try not to complain. It still really is the best deal in town! Note: The space in the window at Gray’s Papaya seems to be reserved for political messages, as it once endorsed Barack Obama for president. Now, the company is sending a message about government spending and deficit management. Who ever knew that a dog from Gray’s Papaya came with a free civics lesson? Another note: when prices were raised in 2008, I stopped at Gray’s Papaya on my way to work for a hot dog for breakfast (it’s sick, I know). There were television cameras set up out front. I didn’t know why. Well, it turns out that MSNBC was doing a story on the price increase. And, a good friend of mine, now my roommate, wound up being interviewed about it. He’s in this clip. The Macy’s Thanksgiving Day Parade always attracts a crowd from the Upper West Side of Manhattan down to W. 34th Street, where you’ll find the store for which the parade is named. It can be exciting to cram onto the streets and see each of the floats and balloons roll by. Even if it is chilly outside, with the coffee in your hands quickly growing cold, this is a once-in-a-lifetime opportunity, and experiencing it in person does not compare to having it on television in the background when you’re preparing Thanksgiving dinner. If you come to New York City for the parade, there’s an attraction the night before that doesn’t draw the same hype, yet I find to be much more fun: the balloon inflation. From 3 PM to 10 PM the night before Thanksgiving, crowds converge on the blocks that circle the American Museum of Natural History to watch the balloons slowly take shape. For many, this is an alternative to going to the parade, providing both the experience of seeing the balloons and the feel of an insider going behind the scenes. A unique touch for me is a Gadling family connection: Melanie Nayer‘s father was part of the crew inflating the balloons in years past. %Gallery-108282%You can feel the crowd start to form well before the W. 79th Street entrance. As low as W. 75th Street, the Columbus Avenue sidewalks became crowded, and by the time I passed Shake Shack, on the corner of Columbus and W. 77th Street, I was effectively in line. It moved quickly, however, and within 15 minutes, I was crossing Columbus with friend and fellow travel blogger Laurie DePrete and headed toward the first balloons down on W. 77th Street. From 3 PM to 6 PM, the scene changes drastically. Balloons go up as the sun goes down, and characters begin to come to life. Some, such as Snoopy, were not yet recognizable, while others, including Shrek and a Smurf, were already recognizable. At points, the bodies were jammed in, making it virtually impossible to move, but there were spots where the spectators moved easily. Turn the corner from W. 77th Street to Central Park West, and there’s nothing to see: all you do is walk up to W. 81st Street, where the spectacle continues. Spiderman, Santa and Kung Fu Panda were taking shape on the street. He exit wasn’t as crowded as the entrance, but t still took a few minutes to push up to W. 82nd Street, where the walking was a little easier. If you’re without kids, the next natural stop is Prohibition, a bar on Columbus Avenue between W. 84th Street and W.85th Street for an excellent Irish coffee and a chance to shake off the chill of the November evening air. There’s nothing quite like going behind the scenes of the Macy’s Thanksgiving Day Parade, even if it isn’t the exclusive experience that it sounds. If you do want to get a great view, though, whether it’s for the balloon inflation or the parade itself, nothing compares to making friends with someone who lives in a building overlooking the inflation or parade route! Tourists photograph Midtown and Lower Manhattan, while locals click their cameras in the East Village and Chinatown. So, it’s clear: tourists and locals don’t mix in New York. Eric Fischer, a computer program, used geotagging data from Flickr and Picasa to plot maps of New York and 71 other cities, using a system he created for determining which shutterbugs are locals and which are from out of town.